Confessing one has cancer can nauseate people in a conversation, but talking about cervical cancer is almost a tabu in patriarchal and conservative societies worldwide. These are some of my realizations after discussing the topic with people from different countries around the globe, such as Brazil, Kenya, Rwanda and United States. Cancer of the cervix uteri is the 4th most common cancer among women worldwide, with an estimated 527,624 new cases and 265,672 deaths yearly (Globocan 2012). From these statistics, about 8,000 Brazilian women die every year where cervical cancer ranks as the 3rd most common type of cancer among women - in Kenya, cervical cancer ranks as the 1st leading cause of female cancer. While these numbers are frightening, a fearless team led by four women (Fig.1.) have worked together to gather and quantify Pap test images in order to improve cervical cancer cell analysis as part of the public health system. 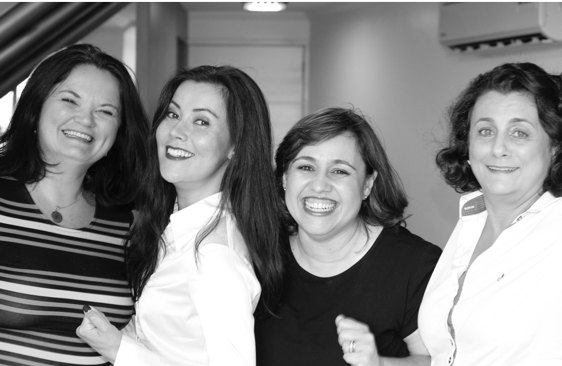 Prof. Dr. Claudia Carneiro, Dr. Dani Ushizima, Prof. Dr. Andrea Bianchi and Prof. Dr. Fatima Medeiros. We are motivated by the high probability of the cervical cancer cure at early stages and early detection of precursor lesions caused by the Human Papilloma Virus (HPV). The identification of an abnormal Pap test result leads to more investigation and the patient is more likely to receive treatment in case of a positive diagnosis. The dream started with the realization that early detection of precancerous lesions from Pap tests has saved lives for decades, but proper microscopic quantification of cervical cell properties remains restricted to few women. The reason for such limitations is the analysis protocol: the most common approach relies on the visual screening of a Pap smear glass slide and searches for abnormal cellular patterns. Such reliance upon manual inspection by a pathologists hinders the ability of public health programs to scale to the population growth, particularly when using Pap smear as the cervix health exam. In a partnership between with BIDS, Berkeley Lab and Science without Borders (Brazilian Federal sponsor analogous to NSF), the team has created several software prototypes and written impactful scientific journals addressing their findings. This initiative is also responsible for the formation of highly specialized personnel, summing up more than 20 students who were/are involved in the project, 3 of them hosted by BIDS, Daniel Ferreira (PhD student) being the most recent arrival. One of the most recent papers report results on a new software called pyCBIR used for image retrieval based on similarity: Reverse image search for scientific data within and beyond the visible spectrum.